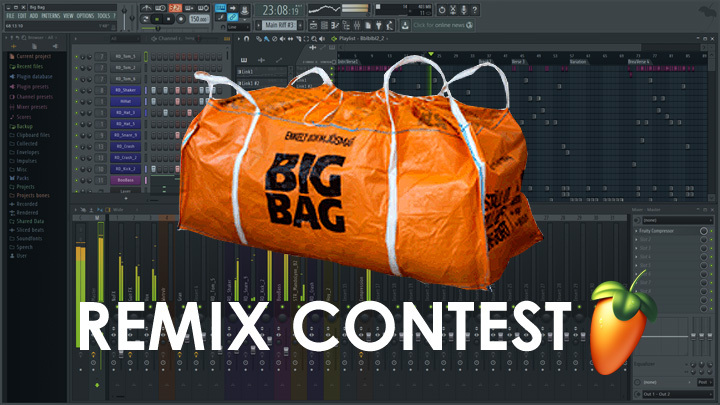 Welcome to the BIG BAG FL Studio Remix Contest ... originally released 2003, what can you do 15 years later? 1. $1000 IL VCash + FL Studio Cap and T-Shirt of your choice. 1. Prizes - All winners will be chosen by Image-Line Software & Yob. Winners will be required to submit their FL Studio project directly to Image-Line for scrutiny. Where physical prizes are sent the recipient will be responsible for any local import duties and or taxes. 3. Production requirements - Valid entries can ONLY use FL Studio 12 as the main production platform. As we will consider the winner as a DEMO PROJECT in FL Studio 20, ONLY Image-Line plugins can be used! 4. Duration - Contest closes Midnight CET Wed, Feburary 28. Judging will take place over a 2 week period by Image-Line & Yob. NOTE: We reserve the right to extend the deadline. If it holders, I places. Last edited by 8o8inSquares on Tue Feb 27, 2018 11:22 am, edited 7 times in total. Last edited by pararealist on Mon Feb 05, 2018 5:42 pm, edited 11 times in total. Last edited by tylerislegend on Thu Mar 01, 2018 4:29 am, edited 2 times in total. Last edited by V_Grey on Fri Feb 23, 2018 7:38 pm, edited 1 time in total. Last edited by Ak24 on Sat Feb 03, 2018 9:57 pm, edited 2 times in total. Last edited by Goldhands Disco on Sat Feb 17, 2018 8:58 am, edited 1 time in total. And a place of beholdness right here. Last edited by C4ND0R on Sat Feb 03, 2018 9:10 pm, edited 1 time in total. Last edited by Corrosionred on Fri Feb 16, 2018 6:55 pm, edited 1 time in total. Last edited by UNDRTHNDR on Fri Feb 23, 2018 7:22 pm, edited 7 times in total. Last edited by Patrick_Films on Sat Feb 24, 2018 8:47 am, edited 2 times in total. Last edited by Cuzz Beatz on Tue Feb 06, 2018 1:56 am, edited 1 time in total. Last edited by Grave on Wed Feb 07, 2018 6:22 pm, edited 1 time in total. Last edited by spellmynamewithabang on Thu Mar 01, 2018 1:02 am, edited 13 times in total.